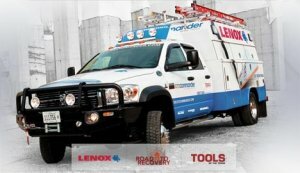 Tools Of The Trade, Lenox, and a number of other sponsors have teamed up to create the Site Commander Ultimate Work Truck. The Site Commander is built around a 2008 Dodge Ram 5500 HD 4x4 Quad Cab, and has everything one would need to run a small business from a truck. Not only is the Site Commander big enough to haul around all of your tools, but it also comes equipped with things you typically would not find in a truck. Does your truck have a 20" monitor, dvd player, and computer? Does your truck have a Segway with built in Segway storage? The Site Commander has all of those features and more, so head on over to The Site Commander website and enter to win the truck for yourself.